Stanford University School of Engineering | This easy-to-assemble black box is part of an experimental urinalysis testing system designed by Stanford engineers. 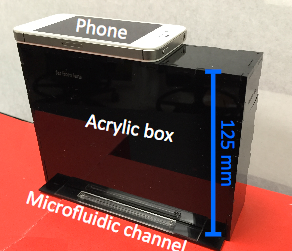 The black box is meant to enable a smartphone camera to capture video that accurately analyzes color changes in a standard paper dipstick to detect conditions of medical interest. Two Stanford University electrical engineers have designed a simple new low-cost, portable urinalysis device that could allow patients to get consistently accurate urine test results at home. The system uses a black box and smartphone camera to analyze a standard color-changing paper test, using a medical dipstick dipped into the urine specimen, to measure levels of glucose, blood, protein, and other chemicals — which can indicate evidence of kidney disease, diabetes, urinary tract infections and even signs of bladder cancer. The current standard dipstick test uses a paper strip with 10 square pads. Dipped in a sample, each pad changes color to screen for the presence of a different disease-indicating chemical. After waiting the appropriate amount of time, a medical professional — or, increasingly, an automated system — compares the pad shades to a color reference chart for results. But the test takes time, costs money, and creates backlogs for clinics and primary care physicians. The results are often inconclusive, requiring both patient and doctor to book another appointment. So patients with long-term conditions like chronic urinary tract infections must wait for results to confirm what both patient and doctor already know before getting antibiotics. Tracking patients’ progress with multiple urine tests a day is out of the question. Writing in Lab on a Chip, a journal of the Royal Society of Chemistry, Bowden and Gennifer Smith, a PhD student in electrical engineering, explain they designed their system to overcome three main potential errors in a home test: inconsistent lighting, urine volume control, and timing. To fix this, the engineers designed a multi-layered system to load urine onto the dipstick. A dropper squeezes urine into a hole in the first layer, filling up a channel in the second layer, and ten square holes in the third layer. Some clever engineering ensures that a uniform volume of urine is deposited on each of the ten pads on the dipstick at just the right time. Finally, a smartphone is placed on top of the black box with the video camera focused on the dipstick inside the box. Custom software reads video from the smartphone and controls the timing and color analysis. To perform the test a person would load the urine and then push the third layer into the box. When the third layer hits the back of the box, it signals the phone to begin the video recording at the precise moment when the urine is deposited on the pads. Timing is critical to the analysis. Pads have readout times ranging from 30 seconds to 2 minutes. Once the two minutes are up, the person can transfer the recording to a software program on their computer. For each pad, it pulls out the frames from the correct time and reads out the results. The engineers also plan to design an app to send the results directly to the doctor. Funding for this research came from the National Institutes of Health, the Rose Hills Foundation Graduate Engineering Fellowship, the Electrical Engineering Department New Projects Graduate Fellowship, the Oswald G. Villard Jr. Engineering Fellowship, the Stanford Graduate Fellowship and the National Science Foundation Graduate Research Fellowship.